My Dad's side of the family is quite a big family (My dad is one of 17 brothers and sisters) and I have 76 cousins and a lot of nephews and nieces and a few grand nephews and nieces too. So there was more than one reason in creating a family website. We were using a yahoo group to keep in touch and the website was a natural progression to that mailing list. 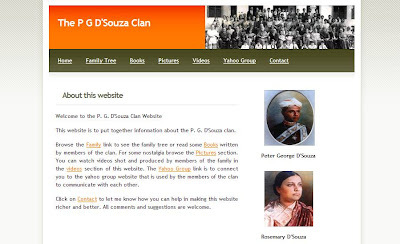 We have collected some very old photographs, some videos made by members of the family and books written by the family and have posted them here. I have used PhpGedView as the family tree software. PhpGedView allows more than one person to edit the family tree at the same time and there are a lot of details that can be maintained for each member of the family. It is very straight forward to install. All you need is a web host that supports PHP. I got the template for the website from Open source Web Design. You have a lot of nice templates here that can help you get the basic website design in place very quickly. For digitizing the books written by members of the family I first scanned the books and then used Adobe Acrobat's optical character recognition software to create a PDF and then saved the PDF as a text document. We then formatted the text document into HTML files manually.